What If Pelfrey Pitches Well Tonight? After seeing him struggle mightily in his first four starts of the season, we as Mets fans naturally would like to see Mike Pelfrey pitch well for a change. However, if he does pitch well, there could be a drama brewing behind the scenes. Because tonight, Mike Nickeas gets another start behind the plate. It could be argued that he’s in the lineup because Arizona starter Joe Saunders is a lefty, and Josh Thole struggles against lefties. Fair point. Additionally, Nickeas hit his first MLB homer last night, and seems to be swinging the bat well. Again, fair point. Also, there is the idea that the Mets just won for the first time in a week, so why mess with success? Trot out that same lineup again if you can. All good points, I’m sure you agree. But, there’s another less-obvious reason why Nickeas should be getting the start, and might be getting another start five days from now: his ability to communicate. Those who watched last night’s win no doubt noticed that Chris Capuano pitched well, and rarely shook off Nickeas — the two had a good rapport, and Capuano was apparently pleased with Nickeas’ game calling. In contrast, Thole and Pelfrey have had some trouble being “on the same page” — to the point where Pelfrey all but criticized Thole’s pitch selections. One must wonder: if there was a righthander on the mound for Arizona tonight, and Nickeas hadn’t hit his first big-league homer, would Nickeas still be getting the start? More importantly, if Pelfrey goes out and pitches six or seven strong innings, and Nickeas gains his trust, what does that mean for Josh Thole? Nickeas caught Pelfrey in his last start against Atlanta, and the end result wasn’t anything to write home about — 5 innings, 11 hits, one walk, 4 earned runs. Despite the high hit total, I saw a mild improvement in the consistency of his mechanics and in turn, his command — might that have been because he was less concerned with the fingers thrown down by Nickeas and therefore able to focus on repeating his delivery? I could be reaching, but it’s a possibility. Considering how important Pelfrey is to the Mets’ rotation, it will be interesting to see what transpires tonight. If Pelfrey struggles again, I would think that the Mets consider sending him to the bullpen — or the minors — to work on things when Chris Young comes off the DL. If Big Pelf has a strong outing, Mike Nickeas may find himself with another start behind the plate in five days — regardless of who pitches for the opposition. In turn, Ronny Paulino may be held back in rehab for another day or so. For the first time in at least 16 years, the Mets out-managed the Braves to a victory. And yes, that includes the Bobby Valentine years (no offense, Bobby V.). It’s not fair to nitpick Terry Collins’ strategical decisions in the first game of the year, and his first game managing in the bigs in a dozen years. And in fact, I’m not sure he made any poor choices during the contest, but there was one move that was particularly “telling”. Many of you may have seen the Mets first televised spring training game of 2011, played against the Braves on Saturday afternoon. These games don’t count for much, so I won’t go into detail about what happened, but there are things we can take away from them; here are notes regarding selected players. Velocity looked good, and he mixed in some good downward-breaking curves, though his ability to command it was inconsistent. In fact his command overall was inconsistent on all pitches. His mechanics look fairly similar to what we saw last year — all over the place, inefficient, and dangerous, particularly when he overthrows. He’s out of control and without balance at the the knee lift, causing him to have to adjust his upper body balance which in turn causes him to open up his front side too early and fall over toward 1B. Strangely enough, it seems his mechanics go more out of whack from the stretch; usually it is the other way around because there are less moving parts compared to the windup. I wonder if it’s because he is rushing his motion with men on base? Thole struggled a bit behind the plate in the first inning with Mejia on the mound, with balls popping out of his glove and getting by. There are a few reasons to explain the issues. First, it was the first game of the spring, so there is going to be some nervousness and rust to shake off. Second, he might have been using a new glove — maybe not brand-new, but possibly new in terms of game use (i.e., the one he was breaking in last year for game use in ’11). Third, Mejia’s command was off, and it’s difficult to adjust to a pitcher who throws 92-95 MPH and isn’t hitting spots. Fourth, at least one time it appeared as though Mejia crossed him up; Thole looked like he was waiting for a pitch to break inside to a LH hitter — i.e., a cutter — but it stayed up and away and by the time Thole adjusted, the ball was moving too quickly and deflected off his glove. Finally, I still don’t like the way Thole sets up behind the plate, with his upper body leaning forward — it makes him vulnerable to being handcuffed by pitches that break late. More than half of MLB catchers use a similarly inefficient stance, but can make up for it with supreme athleticism and anticipating the flight of pitches. Thole might be athletic enough to get away with it too, but time will tell. I talk about this a bit more on a video chat with Kerel Cooper coming soon at OnTheBlack. On the one wild pitch by Mejia that allowed a runner to score from third, Thole made the mistake of trying to catch the ball with his glove — as an infield might catch a ground ball — rather than keep his glove down to the ground and block the ball with his body. So when the ball took a wicked hop, it skipped off of his glove instead of getting absorbed by the chest protector. I’m not going to blame Thole, though — that was a very tough pitch to stop and it might have skipped past him even if he did execute proper blocking mechanics. But spring training is about the process, not necessarily the results. wow, this young man can swing the bat. And he’s only 21 years old. His mechanics look pretty good in that he stays on a straight line toward home plate and gets momentum going forward. Though, he doesn’t get his head and upper body low enough at and after the release, which is strange because he used to get his “nose to toes” in the past. As a result his release is a bit on the high side and he cuts off his arm deceleration. I wonder if he was just jacked up and over throwing? Otherwise his velocity looks good and he gets heavy sink, which led to a bunch of ground balls. His one mistake was hit over the fence — a high, flat fastball that got too much of the plate. Luis looked smooth turning the DP, but has not regained any of the range he’s lost over the years. At the plate he was his usual underwhelming self. Buchholz showed he has a sharp 12-6 curve, and his mechanics are fairly efficient in that he has good balance through most of his motion. From a distance, and with a very quick look at him from the chest up, he sort of resembles Aaron Heilman (facial features, not mechanics). I like Mike’s footwork behind the plate and his quick release on throws to second. I don’t love the way he drops to a knee upon receipt of nearly every pitch; that is partly related to the Thole’s aforementioned issue with leaning forward in the stance, but also is attributed to not being familiar with the movement of a pitcher’s pitches. Otherwise, he looks relaxed, comfortable, and confident back there. At the plate, though, he looked a bit overmatched. This young man does not get cheated on his swings; he kind of reminds me of Mike Hessman in that way. However, there was a situation where the Mets had a man on third and less than two out, and all Zach needed to do was get the bat on the ball. He had a 3-0 count and was given a meatball but he took it for strike one. Since it was ST and the Mets needed a run, I’d be surprised if he didn’t have the green light there. Eventually, Lutz struck out taking two huge hacks at tougher pitches. Not great situational hitting; I’d have preferred to see him cut down his swing a bit and either lift or stroke that 3-0 pitch into the outfield to get the run home. According to ESPN’s Jorge Arangue, the Mets are close to signing free-agent catcher Ronny Paulino. If indeed this deal becomes reality, it gives the Mets a very good backup to Josh Thole — and one who, if motivated, can challenge Thole for the starting job. Of course, that’s a big “if”. Paulino has always had the physical talent to be a solid, perhaps above-average, Major League catcher. He has a strong and accurate arm, balanced setup behind the plate, and can move his feet pretty well for a man his size — when he’s at a good playing weight. Offensively, he has the physical tools to hit for power and has at times shown an ability to get on base. However, Paulino has also been something of an enigma. He’s been wildly inconsistent, both behind the plate and at it. Part of it, I’m sure, has been bouts of lazyness, an inability to stay focused, and a chronic weight problem. In some ways, he may remind one of Ramon Castro, though I think Paulino has better all-around defensive skills. He also reminds me a bit of Javy Lopez — another catcher who perpetually underachieved due to issues of motivation and concentration (though, Lopez was far more gifted offensively). Maybe Paulino can reach his potential under a strict disciplinarian like Terry Collins, who knows? Maybe someone on the Mets’ medical staff will find out the guy needs medication for A.D.D. At worst, the Mets get a RH-hitting catcher who hits very well vs. LH pitchers and provides solid if inconsistent defense — a good foil to Josh Thole. At best, the Mets may catch lightning and have an everyday catcher similar to Miguel Olivo. Assuming the Mets sign Paulino to a cheap, one-year contract, it’s a good deal for them — particularly considering the dearth of catching available on the free agent market. 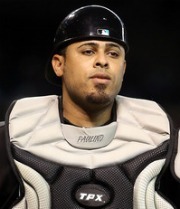 Though, I’d still like to see them make a play for Dioner Navarro. Adam Rubin has more on Paulino here. According to Jason Beck on Twitter, the Detroit Tigers have signed Omir Santos. The former Topps All-Rookie Team catcher took a minor-league contract and will be insurance behind Victor Martinez and Alex Avila. A few weeks back, Sandy Alderson mentioned that the Mets needed some catchers. With Santos leaving for the Detroit system, the next backstops on the depth chart behind Josh Thole are Mike Nickeas and … hmmm … not sure … Kai Gronauer? 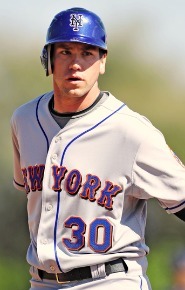 For me, Josh Thole was one of the biggest and most pleasant surprises of 2010. Based on what I saw of him in late 2009, I didn’t think Thole would ever evolve into a mediocre Major League catcher, and further, did not believe he’d ever provide enough offense to make up for his lack of defense. As it turned out, I ate crow on both accounts. Thole developed enough skills behind the plate to be mediocre – i.e., not significantly hurt the team’s chances of winning. He received the ball without embarrassing himself, was mobile enough to block a few pitches, and showed enough improvement with his footwork to throw out some runners (he caught 11 of 24, or 44%). I wouldn’t go so far as to say he controlled the game from behind the plate, but he must have done a decent job of handling pitchers and calling games, since pitchers had an ERA of 3.58 with him behind the dish. Additionally, Thole provided far more offense than I ever expected, hitting .277 and posting a .357 OBP. His .723 OPS was uninspiring, but if he can continue to get on base and make contact, he has an outside shot of being a poor man’s Jason Kendall. Since Sandy Alderson values the ability to get on base, and the Mets are in rebuilding mode, I’d imagine that Thole gets the opportunity to catch a full season in 2011 and show what he can do. If he can match the defensive improvement he made from ’09 to ’10, and continue to get on base around 36% of the time, the Mets might have something. My only concern is that his catching mechanics are limiting, in that they’re acceptable, but require significant athletic ability to improve upon. But who knows, he might have that ability, and/or he may improve enough offensively that it won’t matter.